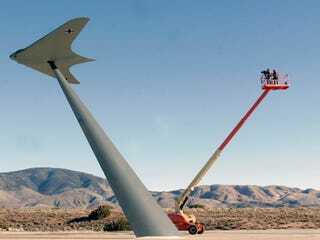 Nazis or aliens or Nazi aliens are back and they have invaded Northrop Grumman's top secret grounds in California, where engineers have been testing the surprising anti-radar capabilities of the Horten 2-29 fighter. The results: It could have changed everything. Germany lost the Battle of Britain partly thanks to the British radar. The fat baton-bearing lunatic and chief of the Luftwaffe Hermann Göring turned to the Horten brothers to develop something that would give the German air force superiority. They came up with the most advanced plane of the war, one that surpassed everything else out there by three decades but fortunately never had the time to be produced in any kind of significant numbers: The Horten 2-29, an airplane unlike anything else out there, which—as this reconstruction shows—looks alien in its design. Northrop Grumman's black-op engineers—who usually work in top secret USAF projects like the B-2 Stealth Bomber, Ho 2-29's design heir—analyzed (again?) the remains of the only surviving plane, reconstructed it, and tested its stealth capabilities. It's probably not the first time they have done that, but this time they did it for a National Geographic TV documentary. As it turns out, Hitler had an stealth fighter in the Ho 2-29—kind of. Thanks to the use of wood and carbon—which increased its radar absortion—jet engines integrated into the fuselage, and its blended surfaces, the plane had its radar footprint reduced by 37% against the primitive British radar system. This means it could have been in London eight minutes after detection. In comparison, other planes took 19 minutes since detection to target, which gave the RAF fighter enough time to scramble and hunt down the bastards. The Ho 2-29 would have made the interception almost impossible, if at all. The bad news is that this plane could have completely changed the course of the war if Germany only had one or two extra years of lead time. Not only in the fight against Britain, but also against the US and the Soviet Union. The Horten brothers had another design based on the Ho 2-29. A design for a intercontinental strategic bomber, the Ho 18. The 142-foot wingspan bomber was submitted for approval in 1944, and it would have been able to fly from Berlin to NYC and back without refueling, thanks to the same blended wing design and six BMW 003A or eight Junker Jumo 004B turbojets. As the documentary shows, had the Nazis extended the war in 1946 and developed the atomic bomb as planned, the Ho 18 could have been their Enola Gay. The good news: That's a lot of ifs, the Allies decided to invade Normandy soon enough, and we are all here without wearing stupid outfits, swastikas, and funny moustaches.